in the Forest of Brindaban " ( detail ), 1710 - 1720. © 1997 Virginia Museum of Fine Arts. Omnipotent god, epic hero and divine lover, Krishna is one of Hindu India's most popular divinities. This exhibition of approximately 20 paintings from the Virginia Museum's collection reveals the powerful impact that this colorful deity has had on Indian painters of the 17th to the l9th centuries. 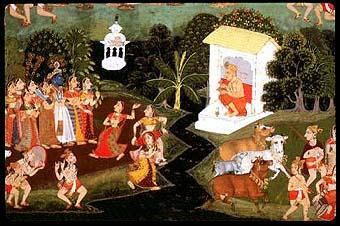 These miniatures record different aspects of Krishna's complex nature and rich mythology. Especially featured are representations of Krishna's life: his childhood, when he lived among the cowherds in Brindaban; his youth, when he flirted with the cow-maidens; his young manhood, when he destroyed his demon uncle Kansa; and his later . years, when he ruled Dwarka and participated in the great war between the Kaurava and Pandava families as recorded in the "Mahabharata," one of India's great epics.